The leather derbie is an essential model of low shoes for women. Pied de Biche had to reinterpret this timeless, proposing a modern version, high-end but accessible. Our craftsmen work with noble materials of the biggest luxury houses, putting all their precious know-how at the service of our collections. How to wear them? Nothing more simple. Women's derbies agree with all the looks to give them a chic and subtly original touch! In jeans or in a more chic outfit, this is the trendy shoe you need. Leather deby is the essential dress shoes for women. Pied de Biche had to reinvent this timeless item, with a modern, high and but yet accessible version. 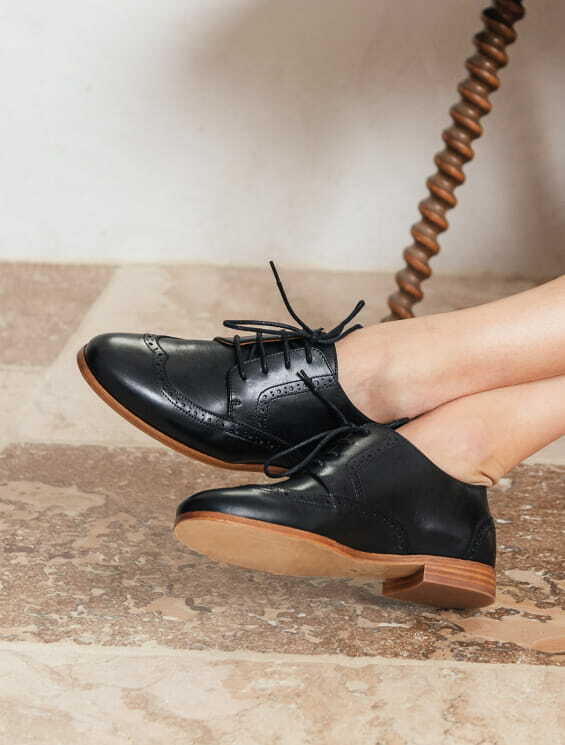 Designed in Paris and produced in Porto, european capital city of shoemaking, our ladies brogue are minutely thought to perfectly fit you. Our craftsmen are working with noble materials, placing their know-how and experience to produce the most qualitative city shoes. The hides they use are carefully selected and cut with cautious to ensure soft, comfortable and resistant leather shoes for women. Pied de Biche women's brogue are made with either smooth leather or pull-up leather. This later is particularly known and appreciated for its recognizable patina. Lined with ful calf leather, our derby shoes will last in time! The leather sole is attached to the upper and yoke by Blake stitch. This technique guarantees both flexibility and finesse. Blake stitching also offers great longevity, since your cobbler is able to re-sole your ladies brogue. The soles of these city shoes have an extra layer made out of natural rubber to give them a better thermal insulation, increased cushioning, as well as a lot of style! Their independant side upper offers a great comfort thanks to easy lacing. Our ladies brogue can be worn with many different outfits: they will thus become your daily basis! They are also available for men. Give it a look !